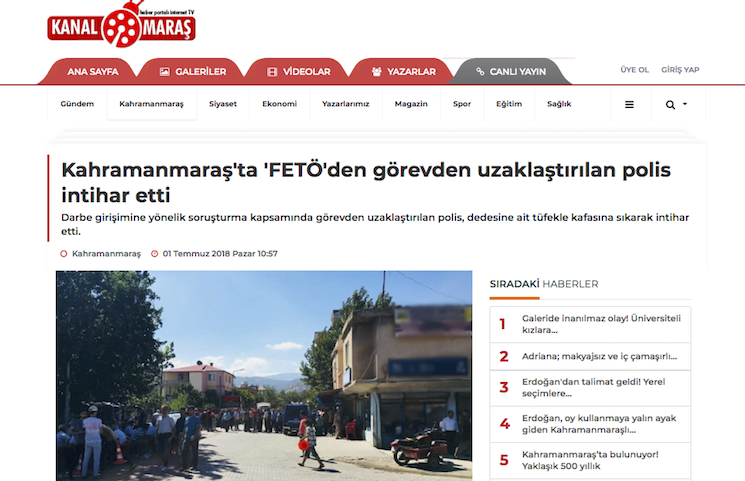 A former police officer who was suspended from the office over his alleged ties to the Gulen movement has killed himself in Kahramanmaras’s Turkoglu district. Local media reported Sunday that 31-year-old former police officer, identified by his initials F.Ç., shot himself in the head with a rifle registered under his grandfather’s name on Saturday. His family members called for an ambulance and F.Ç. was taken to hospital where he was later pronounced dead. Turkish government accuses Gulen movement of masterminding the July 15, 2016 failed coup while the latter denies involvement. More than 150,000 people have been detained and 90,000 arrested over Gulen links since the summer of 2016.